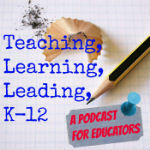 Teaching, Learning, Leading, K12 Podcast is a great new podcast joining the Education Podcast Network. TLLK12 is comprised of interviews and solo shows focused on providing ideas and resources for K-12 teachers and school-based administrators. This podcast is released weekly and is hosted by Dr. Steven Miletto. Dr. Steven Miletto has been an educator in Georgia for 29 years. He has served public school families as a history teacher, assistant principal, and high school principal. Currently, he is the executive director of the Heart of Georgia RESA.